WATERLOO – Following her appointment to the Cleghorn Fellowship in War and Society at Wilfrid Laurier University, Mary Chaktsiris will expand her research on the impact of the First World War on individual Canadian veterans and society as a whole. Chaktsiris says research about veterans’ transition back into civilian life can inform current debates about the social and medical services that Canada provides for veterans. Chaktsiris is the first scholar to hold the new Cleghorn Fellowship in War and Society, funded by John and Pattie Cleghorn and family, Laurier’s Office of the Provost and Vice President: Academic, Laurier’s dean of Arts and the Laurier Centre for Military Strategic and Disarmament Studies (LCMSDS). John Cleghorn, the former chair and CEO of the Royal Bank of Canada, served as Laurier’s chancellor from 1996 to 2003. 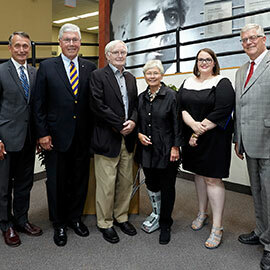 Pattie and John have been generous donors to Laurier and have focused a significant portion of their philanthropy on the research and teaching of the LCMSDS. The two-year fellowship will support Canada’s most exceptional emerging scholars in war and society. Further appointments are scheduled for 2018, 2020 and 2022. The fellows will also serve as assistant professors in Laurier’s Department of History and the LCMSDS. In addition to their research and teaching duties, these scholars will publish their results and communicate their findings to the public through the LCMSDS website, public lectures and seminars, and community teaching initiatives. "The goal of the LCMSDS is to become the premier centre for the study of war and society in Canada, a place where scholars produce new knowledge and train future generations of historians to the benefit of all Canadians,” said Mark Humphries, director of the LCMSDS. “The Cleghorn Fellowships are an exciting opportunity for historians conducting cutting-edge research to share their findings with scholarly audiences as well as the wider community." Chaktsiris, who earned her master’s degree at the University of Toronto’s Ontario Institute for Studies in Education (OISE) and her PhD at Queen’s University, says she’s delighted to be part of the Laurier faculty.